When Philip Seymour Hoffman died of a drug overdose in February, I was angry, but I wasn’t sure why. It wasn’t just your run-of-the-mill what-a-waste rage about the years of great performances he was denying his fans by selfishly cutting his life short with a drug overdose. And I was a big fan, although not necessarily of the performance most people cite as his best, in Capote, which I considered atypically showy; I preferred his subtler but no less magnetic turns in The Talented Mr. Ripley and Before the Devil Knows You’re Dead. I was mad at Hoffman for abandoning his three kids, having witnessed first-hand the damage heroin addiction can do to a family (not my own), but that still didn’t explain why I was having so much difficulty working up any sympathy, muchless empathy, for a man who was universally considered a tragic figure. And I needed to work up some sympathy, as I’d been assigned to write a tribute to Hoffman for TV Guide Magazine‘s Oscar issue. Then I had a breakthrough: I was furious with Philip Seymour Hoffman because I identified with him so profoundly, and I didn’t want to admit it. We were nearly the same age (although he was a year younger), we were both single dads (although he had one more child than I do) and worked in creative professions, primarily in New York City. And I, too, at times in my life, have engaged in self-indulgent behavior (although I’ve never used heroin, or anything close to it) that could’ve threatened my ability to take care of my family. And only then was I able to come up with a line that summed up the tragedy of Philip Seymour Hoffman: He could conjure his demons on screen, but he couldn’t conquer them in real life. 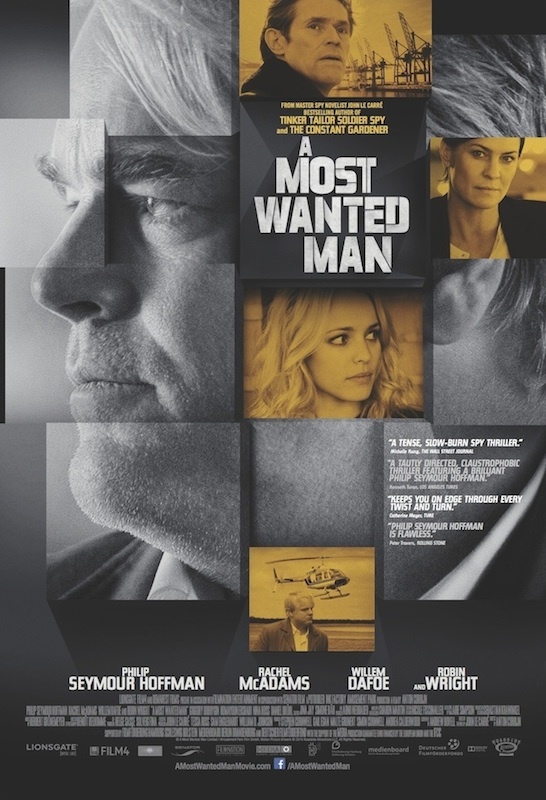 That line echoed in my head as I watched two of Hoffman’s last performances, in wildly disparate roles: as a wily German intelligence agent in the John Le Carre thriller A Most Wanted Man and a hapless Philadelphia criminal in John Slattery’s big-screen directorial debut, God’s Pocket. Neither is a perfect film: A Most Wanted Man takes too long to move all of its chess pieces into place and God’s Pocket’s underwritten script (adapted from a Pete Dexter novel) isn’t nearly as good as its cast, which also includes Richard Jenkins (who brilliantly humanizes the cliched character of an alcoholic newspaper columnist), Slattery’s Mad Men costar Christina Hendricks, and a cadre of top-notch, gritty-inner-city-drama character actors (John Turturro, Eddie Marsan, Domenick Lombardozzi, Peter Gerety, et. al.). But Hoffman’s performances are damn near flawless. Even with a wacky, not-quite-German accent, he’s beautifully modulated in Most Wanted, slow-burning to a final explosion. He was an actor who could do so much with so little, and if anyone knows how little action is often required in intelligence work, it’s Le Carre, who documents the intelligence gathering and analyzing without resorting to James Bond-style derring do. That plays right into Hoffman’s acting-is-reacting wheelhouse. So, too, does his role in God’s Pocket as a two-bit low-life whose ill-fated quest to find out the truth behind the death of his wife’s son (Caleb Landry Jones) at a construction site mostly consists of asking friends for favors and making bad bets, both of which result in only creating more mayhem, none by his own hand. As he watches it all spin out of control, Hoffman’s absolutely riveting. And that’s one mark of a great actor: He doesn’t have to do anything to command your attention. Compounding the tragedy of Hoffman’s loss, millions more moviegoers will witness his upcoming performances in the last two Hunger Games films, parts of which will be computer-generated due to his mid-production demise, than will ever see A Most Wanted Man (even though it performed strongly, finishing in the Top 10 in limited release this weekend) and God’s Pocket, which barely got a theatrical release and is already available On Demand. It’s sadly ironic, because there was nothing computer-generated about Philip Seymour Hoffman: He was flesh and blood, flaws and all.